I’ve been keeping the thoughts about this moment in my mind for many months. I remember the first time I heard about El Camino de Santiago de Compostela. I had attended a church service with my dear friend Shauna from Ottawa. Her minister, a man full of spark and interest in a strangers life told me that this would be the perfect opportunity to broaden my photography portfolio and discover a ton spiritually. The walk takes you through Northwestern Spain, leading each pilgrim to the Santiago de Compostela Cathedral where it is said the remains of the apostle St. James are buried. This was back when my idea to backpack had literally just formed weeks prior. It was still such a dream in the distance that I nodded and listened to what he had to say about it but let the thought flitter away when I left. I’m not sure why because from what he told me it seemed like something I would do and I was genuinely interested in the idea but it never stuck. Then one day, it popped back into my mind. Don’t ask me how because I’ll never know but I started researching information right away and before I knew it, I was hooked. I made my decision right there in my living room that this was something I was going to do as a part of my journey. It had to be. Big thank you’s to Dr. John for that initial spark. I suppose something must have stayed lingering in my mind. I sit in a train station now, caramel latte in hand. My train departs at 9:30 and if all goes well, I will be in a shuttle bus with several other pilgrims leaving from Pamplona to St. Jean Pied de Port in the south of France. I’m wondering what this journey will bring me. In total, I walk 500 miles. That’s 800km walking about 25km per day. When you put it in those terms, I sound completely nuts. I’m only thinking about the first steps right now and to focus on the number I’ll be taking as a whole is silly. I’m certain that with the people I’ll meet and the beauty I’ll see, it won’t seem too daunting a lot of the time. That’s not to say it won’t be a challenge. I know there will be moments that will test my patients, my endurance and my mental and physical strength. It’s going to bring me soaring ups and incredibly low downs. That’s the beautiful thing about the Camino. It takes you on an emotional ride. The phrase I’ve heard the most is this: many people don’t know why they’re walking the Camino until they’ve finished. When they reach the end, they may have not found the answers they were looking for but the person asking the questions is always entirely different. I guess that’s sort of where I sit. I think I’m walking this because I’m going through a bit of a transition period. I’ve switched gears and am heading in the direction of a new passion, a new path. Perhaps the real reason is something I still need to find. I’ve decided not to focus too hard on what that may be. Change happens whether you’re waiting for it or not. Letting it happen on its own makes that moment you realize it’s happened a lot more exciting. I want to be able to share this experience as I walk but I was reminded today that this may be an opportunity to escape for a little while, to get off the grid. I’m sure I’ll be forced to do that anyway since the Pyrenees doesn’t offer free wifi but it’s a very smart thought. I will be writing down every moment and will do the best I can to report back when we pass through cities. I want the majority of this walk to be me, the people I meet and all that nature has to offer. Every silence and empty road is something I plan to embrace fully. After all, it’s part of the experience a pilgrim is meant to have. The scallop shell is a very iconic symbol in the Camino journey. 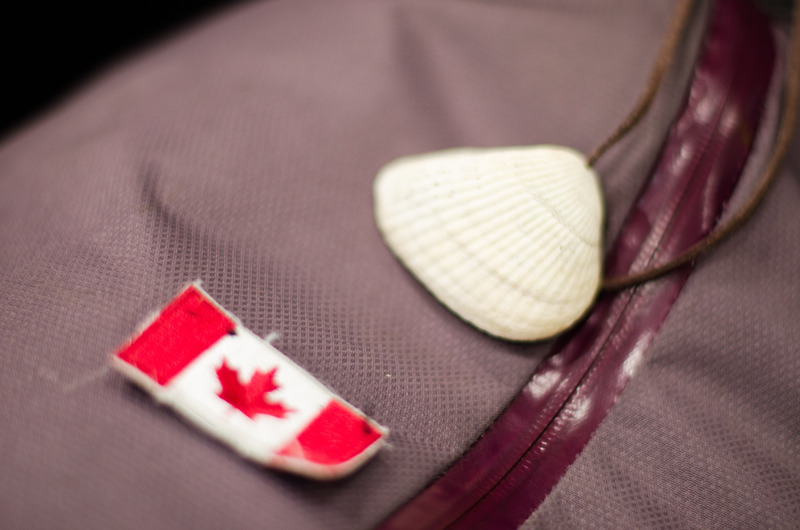 The shell is painted along the route and can be seen on the backpacks of all travellers, helping to guide the way. It represents togetherness and diversity. We’re all walking to the same place no matter where we’ve come from. I thank Rachel for this gorgeous shell she gave me before I left. It will keep the memories of everyone back at home in my heart as I walk. You’re all with me! The support that I know I have back home is overwhelming. I have some very special people matching my steps along the way which is something that touches me more than they could ever know. Well wishes have been sent from the people I care about and am lucky to have in my life. There is a world of unknowns about where this will take me and what I’ll learn about myself. One thing I know for sure is it’s going to be life altering. In what way? Well, that’s for me to discover. Soul by sole. All that’s left to do is take the first step. buen camino sam!…take it slow over the Pyrennes!